The best of style and innovation, elegance and technology. Rossignol Ski Jacket with MEMBRAIN115, a high-tech ski jacket created under a partnership between Rossignol and Trerè Innovation, has won the prestigious iF DESIGN AWARD, one of the world’s most important product design awards. 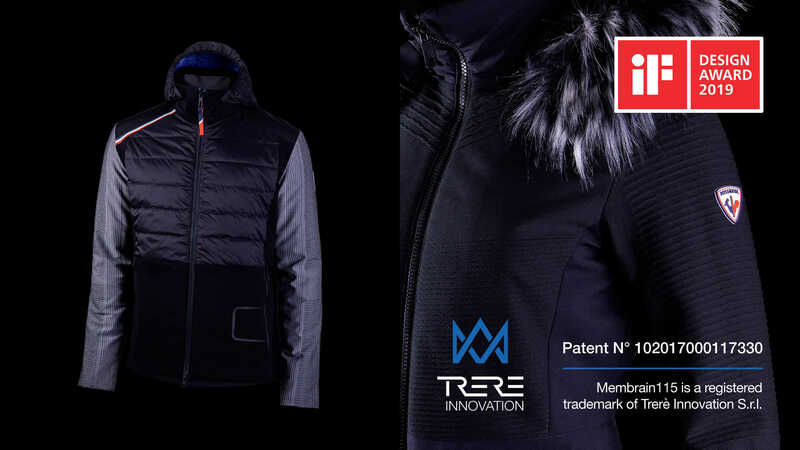 This is yet another acknowledgement of the outstanding qualities of Trerè’s innovative patented MEMBRAIN115 manufacturing method, coming only a few days after the presentation of the prestigious international 2019 ISPO AWARD for the Rossignol Supercorde Ski Jacket Man. The iF DESIGN AWARD is presented every year by iF International Forum Design GmbH of Hanover (Germany), the world’s oldest independent design organization a global symbol of excellence. A jury of 67 world-famous experts examined more than 6400 products and chose to present the award in the 1.02 Sports / Outdoor category to the Rossignol Ski Jacket with MEMBRAIN115. According to the iF DESIGN AWARD Committee, “the Rossignol Ski Jacket presents the perfect match between form and function. In the past these types of garments always presented a compromise: the more durable, breathable and waterproof the material, the more stiff the jacket. Users had to decide: freedom of movement or better protection against the environment. The Rossignol Ski Jacket has solved this challenge by using a highly innovative material: the Membrain115 by Trere Innovation. In addition to this, the designers managed to create an elegant piece of fashion with a timeless appeal. This timeless appeal will ensure a longer life for such a high quality jacket – a thoughtful balance and a question of sustainability”. Innovation, functionality, aesthetics, environmental and social responsibility and brand positioning are the criteria the commission took into consideration. These are precisely the features that make Rossignol Ski Jacket with MEMBRAIN115 perfect for skiers who want maximum perfor-mance without giving up style. The innovative Rossignol Ski Jacket is one of the results of Rossignol’s partnership with Trerè Innovation. The refined design of French brand Rossignol meets the most advanced technology of the Italian company Trerè Innovation, whose futuristic AREAS – Academy for Research and Engineering in Apparel and Sport research and development centre offers us a glimpse of the future of functional clothing. Rossignol Ski Jacket introduces an important new technological development: MEMBRAIN115, a truly innovative combination of a seamless three-dimensional fabric with an intelligent membrane. The membrane makes the fabric water resistant, transpiring, windproof and ultra strong, and above all it does not alter its outstanding elasticity and softness. The Rossignol Ski Jacket with MEMBRAIN115 is like a second skin that “thinks” and “lives” with the skier. Extremely lightweight, it moves along with the skier, and never hinders the wearer’s motions or gets in the way. After coming down the slopes, the skier’s body will still be dry and just the right temperature, thanks to the fabric’s three-dimensional structure promoting air circulation and wicking moisture away from the body. And its unique look of urban inspiration makes Rossignol Ski Jacket perfect for a relaxing stroll after a day on the slopes, too. Style, technology and comfort: Rossignol Ski Jacket with MEMBRAIN115 is the perfect jacket for all occasions.